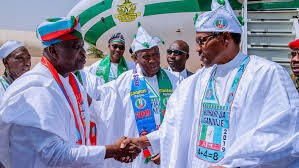 President Buhari campaigns in Lagos, promises to recover Nigeria’s money from looters, send them to prison – Royal Times of Nigeria. Speaking at the event, National leader of the APC, Asiwaju Bola Tinubu said that the opposition in 16 years failed to put Nigeria on a pedestal of growth despite enormous resources. He said the Buhari administration had done a lot with meagre funds and resources just in four years. 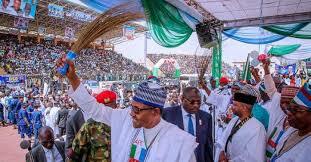 He said Buhari, in his campaign in 2015, made promises which he had fulfilled since he assumed office. Tinubu noted that if the opposition had been dedicated to power generation in their 16-year rule, investors that left the country before 2015 would have remained in the country. The Minister of Works, Power and Housing, Babatunde Fashola, urged the people to get their Permanent Voter Cards (PVCs) ready and vote en-masse for APC, saying that re-electing APC would bring more prosperity and development, among other dividends of democracy.